Millennials are changing the concept of work, shifting prioritization from career advancement to making a difference in their society. This is according to a survey published by the World Economic Forum’s Global Shapers community . With responses from 125 countries worldwide and 285 cities, the Global Shapers Annual Survey 2015 is one of the most geographically diverse surveys of millennials. The more than 1,000 respondents are all members of the World Economic Forum’s Global Shapers Community, a network of over 450 city-based hubs of young, civically engaged leaders aged between 20 and 30. Which country would you live in to advance your career? If millennials could choose – which country would they work in? 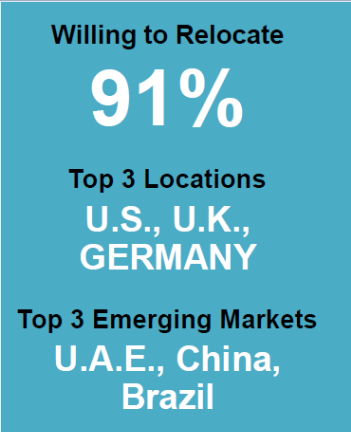 The survey found that the U.S. topped the list, followed by the UK and Germany. Respondents chose the United Arab Emirates as the number one emerging market destination for career advancement, over China, Brazil, South Africa and India, despite the massive scale of the powerhouse BRICS economies. 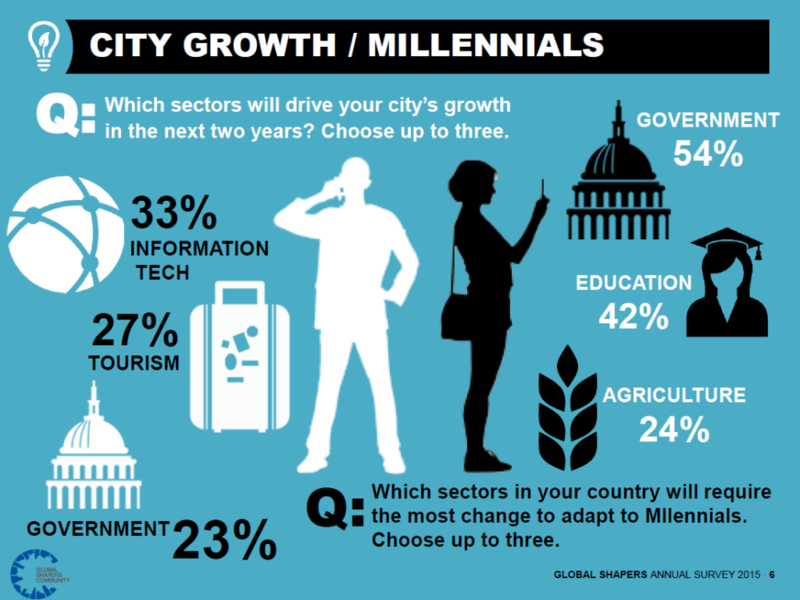 Which sector will require the most change to adapt to millennials? The survey respondents had to identify which sector will drive their city’s growth in the next two years, and which sector would have to change. Information technology, tourism and government were the top three choices for driving growth. Government was also listed as the top sector in need of a change, followed by education and agriculture. There might be a generational shift might under way in the concept of work, with millennials prioritizing the opportunity to make a difference in their society and the ability to learn over straightforward career advancement. Although career advancement was the top attribute Global Shapers looked for in an employer, with 48% choosing it among their top three attributes, company culture came second (38%), followed by training and development opportunities (32%).